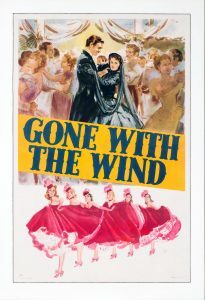 Gone with the Wind by American writer Margaret Mitchell is one of the most famous novels ever written in English. Though it was published in 1936, it is still widely read today, and an equally famous film adaptation of it has been made. It is perhaps the most popular American historical fiction novel of all time. It won the Pulitzer Prize for fiction in 1937, and soon after was adapted into a film in 1939. Anyways, many readers do not have time to read the whole story, so I will give a summary of the plot. The events of the story begin to take place in 1861 in Tara, Georgia. Scarlett O’Hara is a lovely Southern belle who lives on an extensive plantation. Her days are occupied by considering different future husbands, and is especially keen on a man named Ashley Wilkes. However, Ashley is engaged to his cousin, Melanie. When Scarlett and Ashley meet at a barbecue on Scarlett’s plantation, Scarlett tells Ashley of her love for him. The suitor denies her and is promptly slapped by Scarlett, and a handsome man has been watching all the while. His name is Rhett Butler—an adventurer with a troubled past. In the next section of the novel, the Civil War begins. In the midst of this event, Melanie Hamilton’s brother, Charles, proposes to Scarlett. Interestingly, Scarlett agrees to marry Charles despite his boring nature in order to get back at Ashley. After they get married, Charles joins the army, but soon after dies of the measles. Back at home, Scarlett finds out she is pregnant. She gives birth to a son, who she names Wade. However, she is unhappy as a single mother. Scarlett decides she needs a breath of fresh air, so to say, and moves to Atlanta to stay with Melanie and Melanie’s aunt named Pittypat. Scarlett enjoys Atlanta much more than her plantation, and runs into Rhett and starts becoming close with him. Rhett is at once annoying and encouraging in the eyes of Scarlett. The war progresses, and Scarlett and Melanie start to wonder if Ashley is okay. Subsequent to the battle of Gettysburg, Ashley is captured and placed in prison. Atlanta is then taken over by the Yankee army. Scarlett wants to run in fear, but she promised to stay with the then-pregnant Melanie. As the Yankee army sets fire to Atlanta, Melanie gives birth to a son, Beau. Through the turmoil, Rhett aids Scarlett and Melanie with Beau to escape Atlanta. However, as soon as they are outside Atlanta, Rhett joins the Confederate army. Scarlett then travels through peril to reach her hometown of Tara. When she arrives there, she finds her mother dead, and her father mentally unstable. The plantation was looted by the Yankee army. This angers Scarlett so much that she murders a Yankee thief and puts out a fire by a Yankee soldier. Soon enough, the war ends, and many soldiers return home, including Ashley. One homeless, one-legged soldier name Will stays in Tara, helping Scarlett rebuild her plantation. A little time after, news comes that taxes have been raised on Tara in order to get Scarlett and her family out of the town so a government official can purchase her land. Scarlett hatches a plan to get enough money to the pay the taxes by marrying Rhett and goes to Atlanta, as he is now a wealthy man. Yet, she finds out he is in a Yankee prison. Knowing that Rhett is in this condition, Scarlett seduces her sister’s boyfriend Frank, who is a business owner. They get married, and gets Frank to pay off the taxes in Tara. Scarlett spends most of her time trying to make Frank’s business blossom. Rhett finds a way to blackmail himself out of prison, and hands over funds to Scarlett to start a sawmill. Scarlett makes the business profitable, but tragedy strikes again: her father Gerald dies. She goes back to Tara for the funeral, and talks to Ashley and Melanie about staying in Tara to help with her lumber business. After this event, Scarlett gives birth to Ella with Frank. Disaster once again comes to Scarlett as she is attacked by a free black man and white man on her way home. The Ku KLux Klan intervenes and accidentally kills Frank. Some time after this tragedy, Rhett proposes to Scarlett and she accepts. They have a honeymoon in New Orleans, and live in Atlanta as socialites. Scarlett has her third child, Bonnie Blue Butler. Rhett turns out to be a loving father, and spoils her. In turn, Scarlett and Rhett start to have a tense relationship, which becomes bitter. Ashley and Scarlett, no longer interested in each other romantically, strike up a cordial friendship. However, Ashley’s sister spreads rumors that they are having an affair, which Melanie rejects. Amidst this drama, Bonnie dies in a horse-riding accident. Rhett becomes mentally unstable and his marriage with Scarlett is on the ropes. Soon after the funeral for Bonnie, Melanie has a miscarriage and becomes deathly sick. As Scarlett is taking care of Melanie, she promises to look after Ashley and Beau. Melanie dies soon after, and Rhett decides that he wants to leave Scarlett for a simple life in farm country. Scarlett, distraught, stays in Tara with a family friend and is somehow optimistic that Rhett will come back to her. A story of tragedy, war, and desire, Gone with the Wind displays how idealism, lust, and love are not clear cut. They might as well be gone with the wind.